Oranges and the holidays go hand in hand, don’t they? 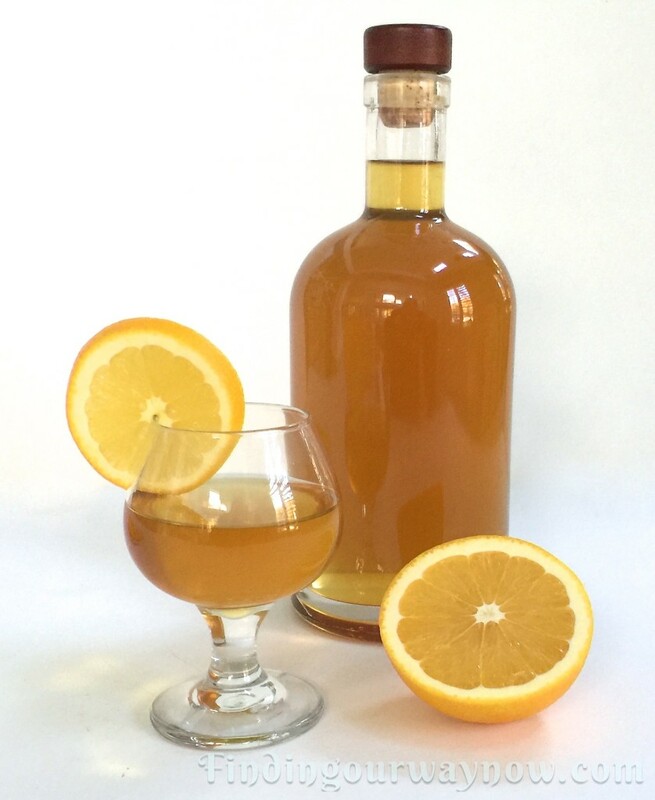 When it comes to celebrations, I find it’s great fun to serve my Homemade Orange Liqueur, or what’s known as Homemade Grand Marnier. It’s pretty simple to make. It’s all about the steeping and the wait time. However, it does take some planning ahead to ensure it’s around when you need it. I’ll mark my calendar somewhere around the end of September to mid-October as a reminder when it’s a good time to start the process of making my homemade orange liqueur; for that matter, any of my homemade liqueurs or cordials. 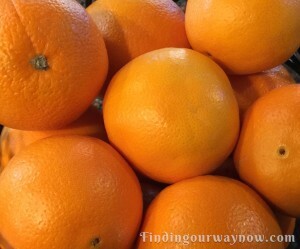 Scrub, rinse and dry the oranges and lemon removing any wax residue. Using a sharp pairing knife or vegetable peeler remove the outer layer of the rind. Be careful to remove all of the white pith that happens to remain on the peel. If left it will impart a bitter flavor to your finished product. Once you’ve zested all of the oranges and lemon, place the zest into your glass jar. 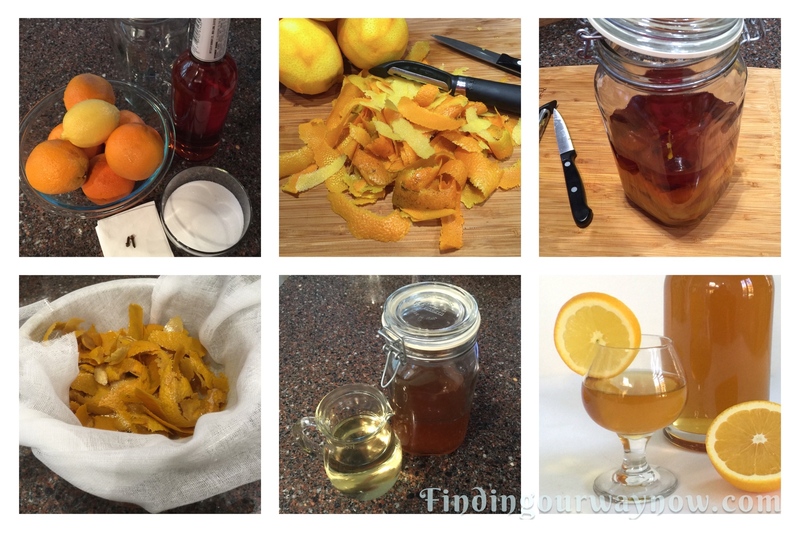 Pour the bottle of brandy over the peels and latch down the lid on the jar to seal. Store the jar in a cool, dry place for 3 weeks minus one day; add the two cloves. Then let steep one last day. I find it helpful to label the jar with the date or set a reminder on my calendar when I need to move to the next step. In a medium saucepan, combine the water and sugar. While stirring, bring to a boil. Reduce the heat to a simmer and continue to stir until the sugars are dissolved, making a clear, simple syrup. This will take about 5 minutes. Move the simple syrup from the heat to cool until it reaches room temperature. While the simple syrup is cooling, strain the infused brandy with orange peels into a bowl through a double layer of cheesecloth. Discard the orange and lemon zest. Strain a few more times to ensure all the residue is removed and the infused brandy is clear. Pour the infused Brandy into a clean latch down lidded jar. Add the cooled simple syrup to the infused Brandy. Clamp the lid back in place and vigorously shake to combine. Let the mixture stand in a cool dark place for one more week. Pour the homemade orange liqueur into decorative bottles with a label and a bit of ribbon and you’re ready to serve or give it away as a gift. It’s good to refrigerate it before serving. The longer it ages in the bottle, the better it gets. You can store it in the refrigerator or freezer for up to 1 year or more. Notes: I’ve said it before, but it’s so important that you remove all of the bitter white pith from the rind of the orange peel. It will make ALL the difference in the overall end product. The quantity of the orange peels, give or take an orange or two, and simple syrup you use is up to you. The more peels, the stronger the infusion. Beware not to overdo it. Sometimes it’s a good idea to check the infusion at 2 ½ weeks to see if it’s reached an orange infusion to your liking. If not, continue steeping as instructed. A top-shelf Brandy isn’t necessary; medium quality works nicely. As for the sweetness, when you’re adding the simple syrup, add a little at a time and taste-test as you go to see if it’s to your liking, adding more as needed to reach your desired sweetness. 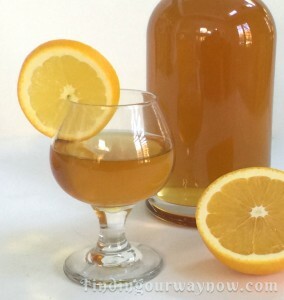 Do this before you steep the homemade orange liqueur for the last week. Waiting 4 weeks is the hardest part with this Homemade Orange Liqueur recipe. However long the wait time, it’s certainly worth it. The taste and the pleasure of serving something made by your own hand are both fun and delicious. Now, aside from the wait time, why not start making this delight today; you’ll be so happy you did. If you enjoyed my “Homemade Orange Liqueur,” check out my Homemade Limoncello, Homemade Coffee Liqueur, or my Homemade Creme de Mint. Enjoy.